Today's announcement of a $1.2 billion settlement is adding to the pressure on shares of Wells Fargo -- and contributing to what was already an attractive opportunity. U.S. stocks are higher in early afternoon trading on Wednesday, with the Dow Jones Industrial Average (DJINDICES:^DJI) and the S&P 500 (SNPINDEX:^GSPC) up 0.10% and 0.68%, respectively, at 12:30 p.m. EST. 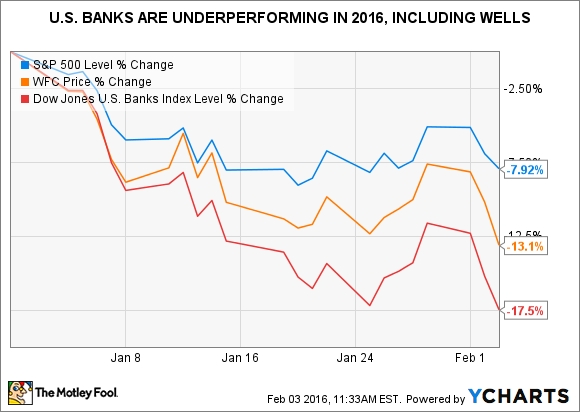 Shares of San Francisco lender Wells Fargo & Co are underperforming, down 1.53%. The market is not reacting well to this morning's announcement from Wells Fargo that it has agreed to settle a suit brought by the U.S. for the tidy sum of $1.2 billion. The complaint, which dates back to 2012, charged that Wells had engaged in "regular practice of reckless origination and underwriting" of loans guaranteed by the Federal Housing Administration (FHA). The FHA is the largest mortgage insurer in the world and boasts that it is "the only government agency that operates entirely from its self-generated income and costs the taxpayers nothing." Although this columnist would generally recommend against individual investors trying their hand at stock-picking, if you're committed to going this route, one of the most effective, time-efficient strategies is to first limit your research to a relatively small group of "franchise" businesses, i.e., high-quality companies that have established a defensible competitive advantage. Second step: You wait until the share price of a company in your coverage reaches a level that represents an attractive valuation; that's when you act. Today, Wells Fargo qualifies on both criteria: It's arguably the best-run large bank in America trading at an attractive price. In reviewing Wells' valuation metrics, I was surprised by what I found. The shares' current price-to-book value multiple of 1.40 is lower than it has been in more than two years. For a lower price-to-tangible book value, one has to go back to the first quarter of 2013. Sure, the period in question is not long enough for us to say with absolute certainty that it was a buying opportunity, but at nearly three years, it's not insignificant, either. 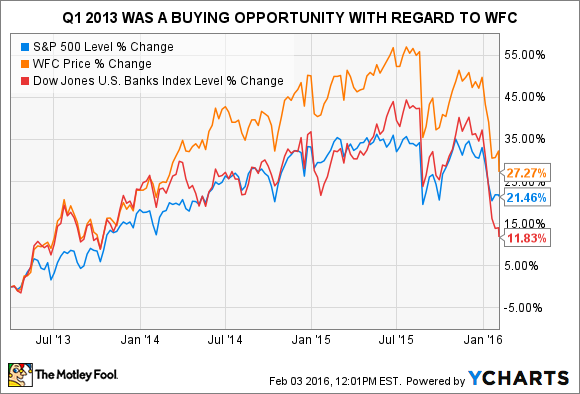 Given the underperformance of the banking sector, it's not entirely surprising that an opportunity such as this has popped up. Not two weeks ago, this column highlighted the opportunity in the shares of Wells Fargo's peer Bank of America. I think B of A's shares sport a larger discount to their intrinsic value than Wells', but Wells Fargo is the higher-quality institution, so there is a quality/valuation trade-off between the two. Nevertheless, both represent attractive buys right now. It's not often that a business of the caliber of Wells Fargo is available for purchase below its intrinsic value. The opportunity won't last forever; stockpickers would be wise to catch this stagecoach before it departs.